Facebook has added a Trending topics feature to the News Feed to help users spot interesting and relevant conversations flaring up across the social network. 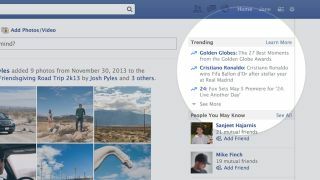 The Trending section will be located on the upper right of the News Feed showing a list of topics personalized by the users' interests. Each topic - ranging from TV shows, events and people - shows up as a headline with a brief explanation on why it's trending. Clicking through any of these items brings up a more focused feed on specific topics complete with friend posts and news items from the users' liked pages. For example, a Golden Globe awards Trending page would bring up stories from ABC and a dozen friend posts regaling what a stud Matthew McConaughey is … or what have you. The social network is rolling Trending out to the US, UK, India and Australia first. Facebook also noted it's continuing its test of the feature on mobile. In an age of "information overload," Facebook is the latest social media company to offer users a way to cut through the noise. Just a week ago, Yahoo introduced the News Digest app at its CES 2014 keynote, which curates news from around the web into a "comprehensive, complete and easy" reading list. Clutter is a problem on Facebook and between all the pages and groups, the regular Facebook News Feed looks like a schizophrenic mess. There's no doubt the social network introduced Trending so users could easily find specific topics and jump to relevant events. Prior to the update, searching for a specific topic on Facebook only brought up events and groups. Trending on Facebook is a long overdue update that Twitter has already had for awhile now. The comparisons to Twitter's trending section are ripe for the picking, though as the LA Times pointed out, Facebook's feature does have a few unique elements, namely personally relevant topics and more robust information thanks to summaries. Your chance to pre-order the LG G Flex on Sprint is here!